Through training and outreach, maker programs aim for greater diversity among future innovators. The maker movement is everywhere it seems. Kids tinkering with sewing machines or laser cutters, designing their own cookie cutters to “print” in a 3D-printer at libraries, museums, maker camps, or classrooms across the country. “Maker-educators” are mashing together technology with traditional arts and crafts, music, and the visual arts to let kids design, build, and invent. It’s a particularly good way to teach creative problem-solving in the STEM subjects—science, technology, engineering, and mathematics. But not everyone is benefiting equally. 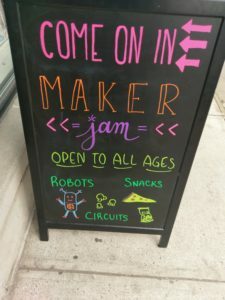 The under-representation of people of color and women in those fields has led one Bronx, New York, nonprofit to promote a new theme in maker-education: social justice. “When we hear ‘social justice,’ we think hitting the streets, but at DreamYard, it’s also understanding your own identity and affirming your history,” said Hillary Kolos, DreamYard’s director of digital learning. DreamYard is a youth arts organization in the Bronx and a part of the YOUmedia Learning Labs Network. “A lot of time black and Latino communities don’t have their history or culture affirmed,” Kolos said. That’s particularly true in the maker movement, a term coined by Make magazine for its audience of hobbyists and would-be inventors tinkering with robots and rockets and cloning figs in their basements. Former Massachusetts Institute of Technology professor Leah Buechley recently reported that 84 percent of people appearing on the magazine’s cover since its inaugural 2005 issue were male and not one was black. To promote greater diversity among future innovators, DreamYard held its second annual Maker Institute in April to share strategies for empowering young people from all backgrounds through maker education. The three-day institute, which attracted 14 teaching artists and educators from youth-serving nonprofits, featured hands-on projects and a “Maker Jam” that participants hosted for families in the community. Speakers at the institute included artists whose work uses technology to express their cultural heritage. Artist Salome Asaga curates a museum with artifacts from workshops she has led on creating “Afrofuturist” artifacts, like a GPS necklace that vibrates at intersections where police shot black people. Another artist, Geo Salas, demonstrated how he creates Day of the Dead skulls on a 3-D printer. Groups of participants were guided by a set of questions DreamYard developed for its afterschool programs. The questions help students reflect on their own strengths and cultural identity, the problems they observe around them, and how they can innovate and work with others to make the community stronger. Dan Schermele, who works as a teaching artist for DreamYard, said that his group worked with the question, “What is our community?” and came up with the idea for “a cart like a little ice cream cart you could roll down the sidewalk [to] parks and play grounds.” It would be filled with supplies for building simple machines, like an LED headband or catapult. “It’s a way to get maker out in the community,” he explained. Schermele works at two of DreamYard’s 40 partner schools, including its high school. His elective high school science class has students design and test models for inventions like rockets and water filtration systems needed to colonize another planet in the wake of a future worldwide catastrophe. He thinks that students will be more likely to pursue STEM careers if they see innovation as something that comes from themselves and their own communities, not just Silicon Valley and other elite tech hubs. Families who came to the “maker jam” on the institute’s last day decorated the pre-cut shields with magic markers, fabric scraps, and circuits made with copper tape and LED lights, Butcher said. The institute got her thinking about how to bring in Latin American artists, scientists, and other innovators from the Corona neighborhood in Queens where the New York Hall of Science is located and how to create maker activities related to their work. She’s also wondering if those activities could help kids and adults invent fanciful or practical solutions to problems they observe in their neighborhoods.